New images have been released of Ultima Thule, the object in the Kuiper Belt that NASA's New Horizons spacecraft flew by in a record-breaking mission last month. They reveal that the object, which sits a billion miles beyond Pluto on the farthest outskirts of our solar system, is flatter than previously believed -- and the "snowman" moniker that Ultima Thule had picked up is therefore not accurate, NASA said. 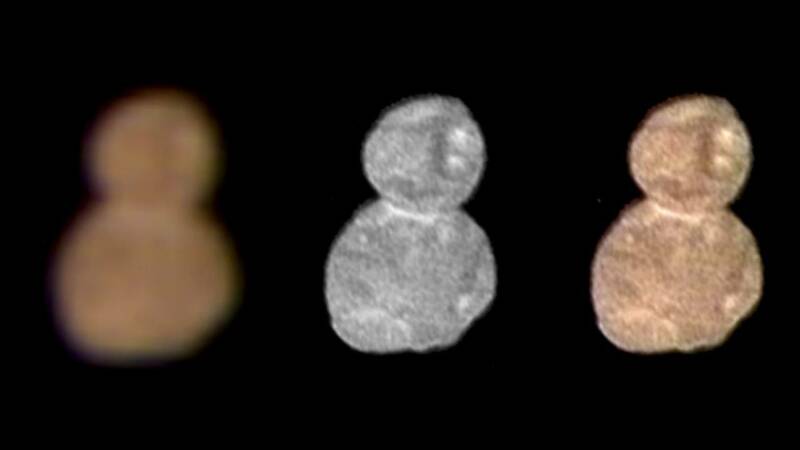 "The first close-up images of Ultima Thule -- with its two distinct and, apparently, spherical segments -- had observers calling it a 'snowman.' However, more analysis of approach images and these new departure images have changed that view," the agency explained in a statement. "New Horizons scientists can confirm that the two sections (or 'lobes') of Ultima Thule are not spherical. The larger lobe, nicknamed 'Ultima,' more closely resembles a giant pancake and the smaller lobe, nicknamed 'Thule,' is shaped like a dented walnut," it added. Ultima Thule became the most distant object ever visited by a spacecraft when scientists from NASA and the Johns Hopkins University Applied Physics Laboratory conducted a flyby on New Year's Day. New Horizons raced past Ultima Thule at 31,500 miles per hour while capturing the images, which have been released in stages. The first pictures revealed what appeared to be a "bowling pin-like" shape to the object. More distinct, color images released the next day revealed a snowman. "This really is an incredible image sequence, taken by a spacecraft exploring a small world four billion miles away from Earth," mission principal investigator Alan Stern, of Southwest Research Institute, said of the newest snaps. "Nothing quite like this has ever been captured in imagery." "It would be closer to reality to say Ultima Thule's shape is flatter, like a pancake. But more importantly, the new images are creating scientific puzzles about how such an object could even be formed. We've never seen something like this orbiting the Sun," he added. The central frame of the new sequence of images was taken at 12:42 a.m. Eastern Time on New Year's Day, when New Horizons was 5,494 miles beyond Ultima Thule, and 4.1 billion miles from Earth, NASA said. Ultima Thule -- officially known by decidedly the less-snappy name "2014 MU69" -- is the farthest object ever visited by spacecraft. It is also the first object in the Kuiper Belt -- a region on the edge of our solar system which is part of the original disk from which the sun and planets formed -- to be observed up close. The name "Ultima Thule" was chosen through a nickname campaign hosted by the New Horizons team. Thule was the ancient Greek and Latin name for a land thought to be the northernmost point on Earth. Ultima Thule essentially means "furthest Thule," which suggests something at the very edge of what is known. "Reaching Ultima Thule from 4 billion miles away is an incredible achievement. This is exploration at its finest," said Adam L. Hamilton, president and CEO of the Southwest Research Institute in San Antonio, after the object was first reached. "We're looking forward to seeing the next chapter."